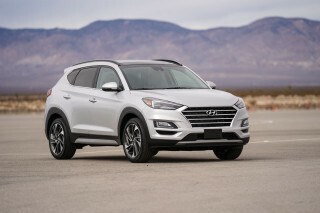 Hyundai's on a quest to improve fuel economy, and tweaks to the Tucson boost its top gas mileage to 30 mpg. That's on the version with the larger engine and automatic transmission--but base versions still get up to 29 mpg. Compact crossovers--cute-utes, if you want--make up a crowded field, one with some strong sellers among them. 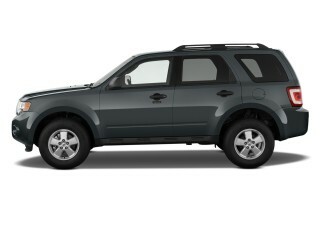 The Ford Escape is 11 years old, and it's still a huge hit. 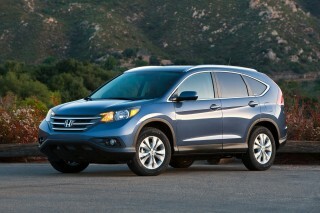 Honda's CR-V lingers near the top ten of sales charts, too. For years, Hyundai's entry in the class was the underwhelming Tucson, but in 2010, it was redesigned to take on the best in the class. The transformation couldn't be more dramatic, starting with the Tucson's daring sheetmetal. The Tucson actually arrived before the latest Sonata, Accent and Veloster hit the scene, and its "fluidic sculpture" theme predicted what was coming to those cars. It's a brash look for a company that thrived on conservative looks for a decade, dramatic, attention-seeking and attention-getting in its anti-SUV stance. There might be an inch of straight line in its silhouette, the rest given up to curves and surfacing that swells at the fenders and crests at the front and rear. 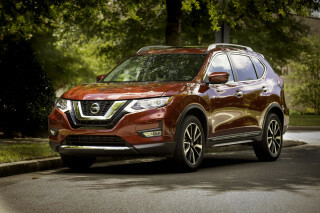 The tail gets a little thick, and there's plenty of brightwork, and it all hangs together as well or better than a Nissan Rogue or an Acura RDX, even. The interior's just a shade less dramatic, with a big LCD screen and vertical blades of metallic trim knifing into bands of tightly grained, low-gloss black plastic. The Tucson lineup is all four-cylinder, with a price-leading 2.0-liter with 165 horsepower in base versions, offered with either a five-speed manual transmission or a six-speed automatic. We've driven the manual transmission and liked its light shift action, but the automatic improves gas mileage to 22/29 mpg and has pretty clean gearchanges, too. 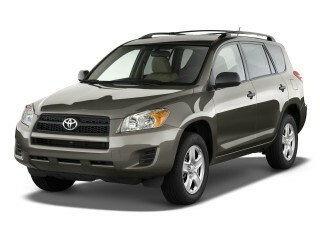 Even better is the optional 2.4-liter four with 176 horsepower and only the six-speed automatic. 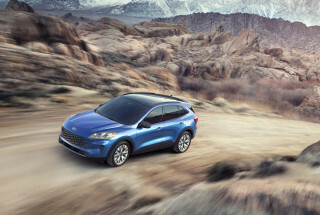 That combination is good for an estimated 21/30 mpg, and moves the Tucson along at a measured pace with relatively low noise and vibration for a big four. The Tucson isn't quick--and as of yet doesn't have the turbo four found in the similar Kia Sportage--but it's a passable straight-line performer. Handling is predictable, and the Tucson rides better than it steers. The slightly firm, settled ride on higher-end versions comes to base versions this year, in the form of more sophisticated shocks and retuned bushings. While the road manners are much better than the last Tucson, the new engine-speed-sensitive electric power steering is a weak spot. It brings with it a small turning circle, great for parking-lot squeezes, but the steering feel isn't as linear as the better electric systems from VW and Ford, and there's little direct feedback from road surfaces. It's more spacious than before as well, and the new Tucson bests some luxury crossovers for interior space. 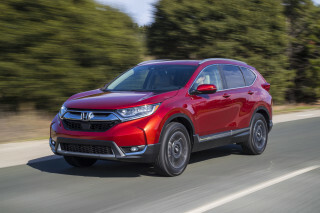 It's smaller by a good margin than the Honda CR-V and Subaru Forester, but four adults, especially those in front, will find ample room in all directions. The rear seat has just enough headroom for taller adults, and good leg room. Given the choice, we'd steer clear of the optional leather seats: the front leather buckets have short bottom cushions that tilt down at their leading edge, leaving them less comfortable than they could be. The Tucson earns the IIHS' Top Safety Pick award, but the NHTSA hasn't crash-tested the latest version. Curtain airbags and stability control are standard, while Bluetooth and a rearview camera are available. Visibility is an issue in the Tucson: its heavily styled rear end has thick pillars and less glass than, say, a CR-V.
All versions have standard power windows, locks, and mirrors; cloth seats; remote keyless entry; air conditioning; and an AM/FM/XM/CD player with USB port. The options list has as many upscale features as some entry-luxury sedans. There's Bluetooth; telescoping steering; leather seating; heated front seats; steering wheel audio controls; a power driver seat; 17-inch wheels; automatic headlights; and dual-zone automatic climate control. More expensive options on the 2012 Tucson include a panoramic sunroof; premium audio; and a touchscreen navigation system fitted in tandem with Bluetooth streaming stereo audio and a rearview camera. Go whole-hog on the options, and the Tucson can reach $30,000. 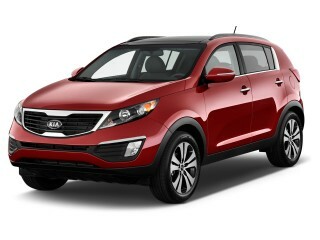 The 2012 Hyundai Tucson is tasteful and stylish, yet it doesn't give up too much practicality. Hyundai's been giving all of its vehicles a total makeover, and the transformation couldn't be more dramatic for the compact Tucson. The 2012 Tucson truly says farewell to Hyundai's plainer past and wears the "fluidic sculpture" look well, as does most of the lineup at this point--including the new Accent and Veloster. It's a brash look for a company that thrived on conservative looks for a decade, dramatic, attention-seeking and attention-getting in its anti-SUV stance. There might be an inch of straight line in its silhouette, the rest given up to curves and surfacing that swells at the fenders and crests at the front and rear. For the Tucson, the design is a world effort, hailing from Hyundai's European design studios, teamed with those in Korea and the United States, with perhaps more than a casual nod to the Nissan Rogue and the Euro-market Ford Kuga. And in a field that's still pretty heavily influenced by old-school SUVs, we think the new styling theme really sets the Tucson apart. It's curved, crested, and looks quite upscale from its nose to its tail, almost like a miniature luxury crossover. It gets a little tall and thick toward the rear--some problems can't be resolved with arcs of chrome trim, after all--but the angular taillamps drop some of the visual weight out of the rear end. Hyundai hits the same global high note with the cabin of the 2012 Tucson. The interior's just a shade less dramatic, with a big LCD screen and vertical blades of metallic trim knifing into bands of tightly grained, low-gloss black plastic. There are better-finished interiors in this class, but it's still a standout design. Limp steering is a letdown in the 2012 Hyundai Tucson, but its smooth powertrains perform well and are very efficient. The Tucson lineup is all four-cylinder, with a price-leading 2.0-liter with 165 horsepower in base versions, offered with either a five-speed manual transmission or a six-speed automatic.The better option, in our opinion, is the 2.4-liter four-cylinder, making 176 hp and 168 pound-feet; it feels quite a bit stronger without sacrificing any real-world fuel-efficiency (EPA ratings are lower). We've driven the manual transmission and liked its light shift action, but the automatic is very smooth and actually more efficient. 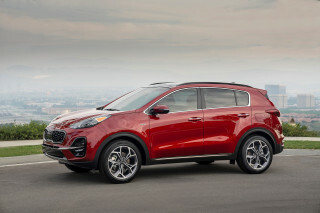 In either case, while the Tucson doesn't offer the turbocharged engine that's available in the related Kia Sportage, it does perform well, with plenty of reserve power for passing with the 2.4-liter. Handling is predictable, but the Tucson rides better than it steers. The slightly firm, settled ride on higher-end versions comes to base versions this year, in the form of more sophisticated shocks and retuned bushings. While the road manners are much better than the last Tucson, the new engine-speed-sensitive electric power steering is a weak spot. It brings with it a small turning circle, great for parking-lot squeezes, but the steering feel isn't as linear as the better electric systems from VW and Ford, and there's little direct feedback from road surfaces. We're also not fans of the mushy, not-so-communicative feel of the brake pedal. The 2012 Hyundai Tucson has a roomy interior that's good for passengers or cargo--even though it's one of the smaller vehicles in its class. By length, width, and height, the 2012 Hyundai Tucson is one of the smaller vehicles in this class, but its rather long wheelbase (longer than the Honda CR-V, Ford Escape, and Subaru Forester) gives it some help where it counts--for seating, and the passenger cabin. The Tucson still offers more interior room than the Ford Escape and the Nissan Rogue, and it outboxes luxury crossovers like the Acura RDX. But next to the likes of the Honda CR-V or Toyota RAV4, it's quite a bit smaller. In the front row, the Tucson affords driver and passenger plenty of leg room. We haven't been so fond of the front seats, which have bottom cushions that tilt too far down (and are too short), leaving passengers uncomfortable after a hundred miles or so. But in back, there's plenty of room for two adults. And we tend to like the Tucson's cloth seats are better than the leather-clad ones--not necessarily because of the upholstery itself, but because the cloth ones seem shaped better. While the Tucson definitely doesn't have space for a third row, it does have a lot luggage space--enough room for groceries for a week for a family, too. It's the sort of rectangular, wide-open space that's also good for pets--or moving small pieces of furniture if you fold the second-row backrests forward. With cubbies and bottle holders in the console and door panels, and a deep glove box up front, there are plenty of smaller storage spaces. There are more hard plastics inside the Tucson than we would have hoped, but fit and finish has been good in all the Tucsons we've driven, and overall the Tucson's cabin feels a step above the plain look of the CR-V or Escape. The 2012 Hyundai Tucson is one of the better safety performers among compact crossovers--even considering the tougher crash tests that have been phased in. The 2012 Hyundai Tucson lands in--or close to--the upper echelon for safety, thanks to good crash-test results and a comprehensive list of safety features. The federal National Highway Traffic Safety Administration (NHTSA) has given the Tucson a four-star score for frontal impact, as well as a four-star overall score, while the Tucson earns a top five-star score in both the side impact and side pole tests. The insurance industry-funded Insurance Institute for Highway Safety (IIHS) has again for 2012 named it a Top Safety Pick, with top ratings in all categories. All-around visibility is quite good, save for some spots at the rear quarters, where the Tucson's dramatic roofline meets its tailgate. The 2012 Tucson covers all the usual bases for safety-conscious shoppers. Dual front side and curtain airbags are standard, as are anti-lock brakes, traction and stability control. 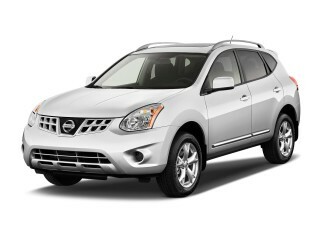 Hill descent control is also standard, along with brake assist, tire pressure monitors, and active headrests. From its feature set, or its interior, the 2012 Hyundai Tucson doesn't feel like the tight-budget offering it is. As shoppers can expect from any Hyundai product, the Tucson comes with all the essentials, as well as some extras, even on the base model. All versions have standard power windows, locks, and mirrors; cloth seats; remote keyless entry; air conditioning; and an AM/FM/XM/CD player with USB port. The options list has as many upscale features as some entry-luxury sedans. There's Bluetooth; telescoping steering; leather seating; heated front seats; steering wheel audio controls; a power driver seat; 17-inch wheels; automatic headlights; and dual-zone automatic climate control. More expensive options on the 2012 Tucson include a panoramic sunroof; premium audio; and a touchscreen navigation system fitted in tandem with Bluetooth streaming stereo audio and a rearview camera. Go whole-hog on the options, and the Tucson can reach $30,000. Warranty coverage is also great--including five-year/60,000-mile, bumper-to-bumper coverage plus 10-year/100,000-mile powertrain coverage. 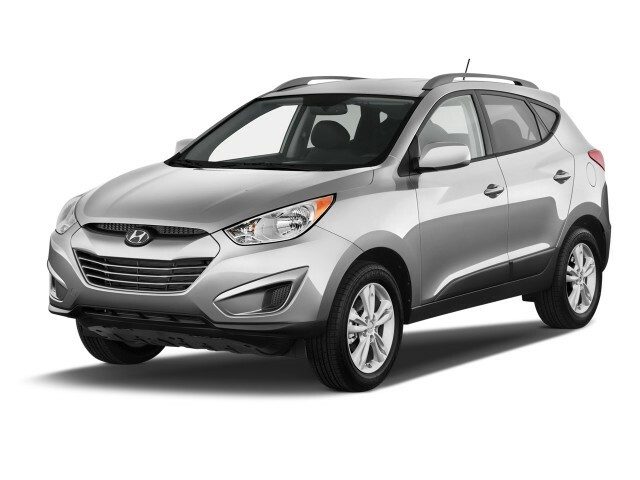 The 2012 Hyundai Tucson is one of the more efficient vehicles in its class, although its gas mileage isn't as good as Hyundai's mid-size Sonata sedan. Hyundai has made vast improvements to the gas mileage of its fleet over the past several year, and the 2012 Tucson certainly does its part. The base Tucson now comes with a 2.0-liter four-cylinder and automatic transmission, and is rated at 22/29 mpg by the EPA. With a five-speed manual transmission, the same engine delivers 20/26 mpg. With the larger, 2.4-liter four-cylinder the Tucson gets 21/29 mpg (manual) or 21/30 (automatic). Adding all-wheel drive drops those numbers by 1 to 3 mpg. NOTE: The Tucson is among those Hyundai vehicles included in a restatement of fuel-economy figures. From the 2011 to the 2013 model year, the EPA has calculated that many Hyundai vehicles had overstated gas-mileage ratings that did not hold up to confirmation testing performed by the agency. Owners will receive reimbursements for extra fuel used, and can initiate payment through Hyundai's site, www.hyundaimpginfo.com.